The Sehal Christ Church attacked on January 16. Hindu fanatics wanted to "avenge" the alleged murder of a woman "forcibly converted ". Sajan K George: "In the Indian state, Christians are between the anvil and the hammer of nationalists and Muslims". 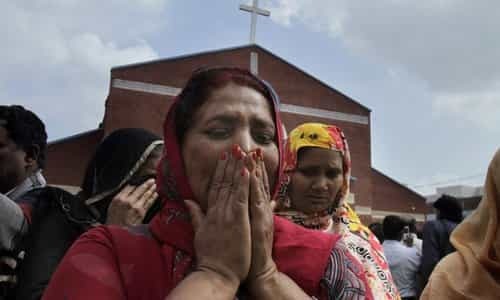 Mumbai (AsiaNews) - A crowd of 300 Hindu radicals assaulted and burned a Pentecostal church and several Christian-owned shops in Jammu and Kashmir. It was reportedly a "revenge" attack for the alleged murder of a woman by her husband. The lady, who converted from Hinduism two years ago, died of complications of a disease contracted years earlier. But the family, which had never accepted her conversion to Christianity, spread rumours of murder and forced conversion, which triggered the violent reaction of the extremists. Sajan K George, president of the Global Council of Indian Christians (GCIC), tells AsiaNews that in the Indian state "Pentecostal Christians suffer the worst persecution. They are accused of forced conversions, and instead people attend prayer meetings and embrace the Lord as their Savior who frees them ". The Christian leader explains that in Jammu and Kashmir "the tiny Christian minority is held between the anvil and the hammer. From 2014 the territory is governed by a coalition between BJP [Bharatiya Janata Party, Hindu nationalist party - ed] and the Peoples' Democratic Party. Christians are persecuted by both: on the one hand, radicals on the extreme right; on the other, Muslim extremists ". The assault on the Sehal Christ Church, affiliated to the Friends Missionary Prayer Band, and located in a village near Nowshera, took place on January 16. The Hindus of the Bajran Dal [youth faction associated with the BJP, ed] a group of 300 assailants broke into the church and interrupted the prayer. The faithful present were beaten up and at least 12 were seriously injured. Two police officers arrived on the scene to quell the violence, but the crowd then moved on to nearby Christian shops, damaging property for thousands of rupees. The Hindus were incited by the alleged murder of Seema Devi, wife of Rinkhu Kumar, who also converted to Christianity. The two were married two years ago and shortly after the wedding the woman’s health problems emerged, which at the time had been treated in hospital. Recently, the new worsening of the illness had prompted Rinkhu to take his wife to Jalandhar, to the church where they had married, to pray for her recovery. On January 11, the woman's condition seemed to improve, until the sudden death occurred on the 15th. After hearing the news of her daughter's death, the family released the news that Seema had been forcibly converted. One uncle declared "that she would never agree to voluntarily renounce his Hindu faith". What most shocked the local Christian community is that after the church attack, the body of Seema was burnt on a pyre, as the Hindu funeral tradition wants. Meanwhile, Christians fled to the forest to escape aggression. At least seven of them have been arrested, including Rinkhu. On the contrary, none of the Hindu assailants have been apprehended. Now local witnesses warn that Christians present on January 16 during the prayer are forced to return to the Hindu religion, under penalty of persecution. Furthermore, the local pastor is untraceable. Sajan K George denounces the climate of violence and states that "the Pentecostals find peace, inclusion and equality in the gatherings of adoration, which leads them in a voluntary way to embrace Jesus and the Church. Hindu fanatics are opposed to all this. In this Week of Prayer for Christian Unity, the GCIC prays for the Pentecostal Churches to be accepted like the main Churches as evangelizers of Jesus and of the Gospel".